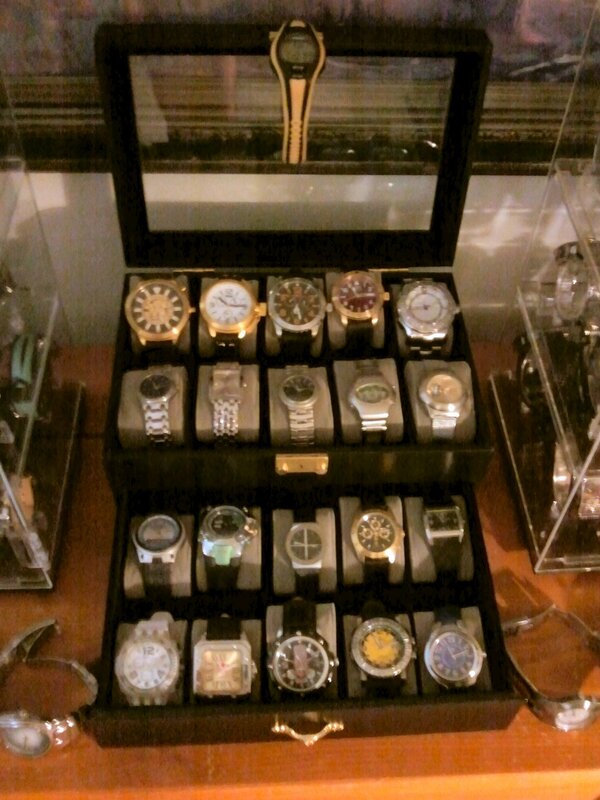 I have previously posted about my fascination with Watches, Clocks and Timepieces. Along the way I have mentioned and promised pics of my entire collection. Much easier said than done, as there are now 282 in all. My vision was to post pics of each, with a short description, current retail price, actual price I paid, and any repairs I performed to restore to working order. As long winded as I tend to be, I’m sure some of you would be willing to run me over in an SUV if I posted in my normal detailed way. To spare you, I try not to do that, and be short and concise, allowing you to enjoy the pics, but make no guarantees as sometimes the details are what make the piece even more special. 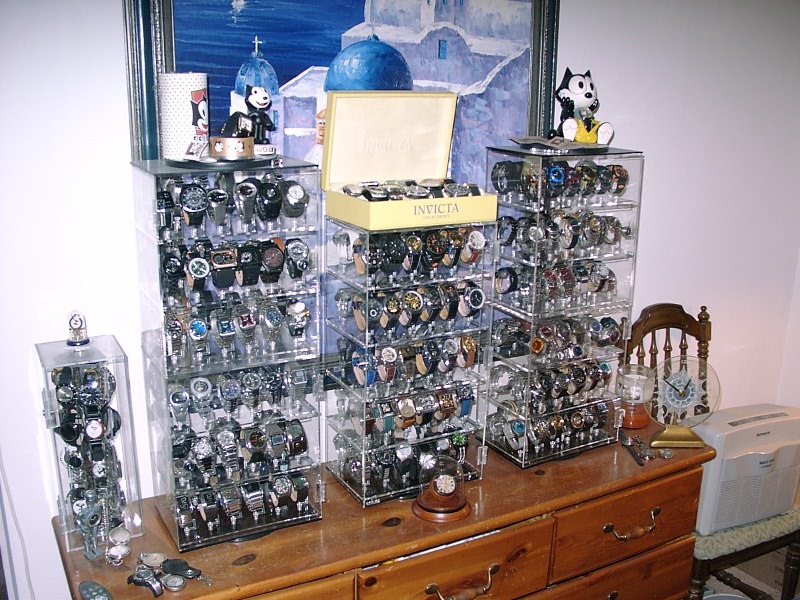 Overall Collection – 282 watches, 6 acrylic cases. (holding 22 x 1, 36 x 4, and 60 x1) 2 leather/Vinyl Cases (12 ea) and 1 double level leather (20 ea.) All full, I’m now out of room, #’s 277 – 282 have no place to go. 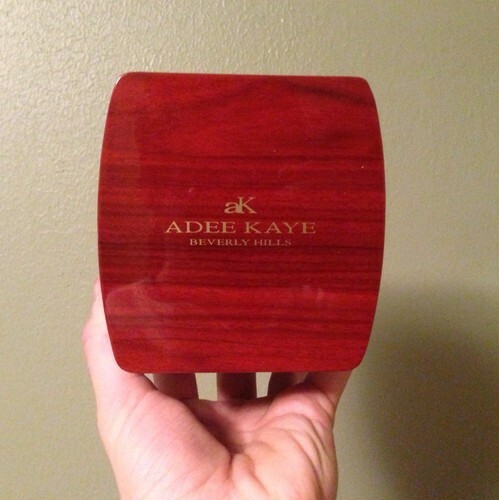 Of the 4 Acrylic cases that hold 36 ea. 2 were each epoxied to the tops of the other 2 upside down. Giving me actually 2 Acrylic turnstile displays that hold 72 Ea. and an empty rotating area above Where the Felix watches sit. NOTE: Pictures shown are stock, or were taken by the seller or previous owner. If you see hands or arms, they are not mine, as I feel my hand/arm celebrity training are not adequate. Marked as new, however case screw missing and feature buttons not working. Possible adjustment of Stems/Contacts needed. 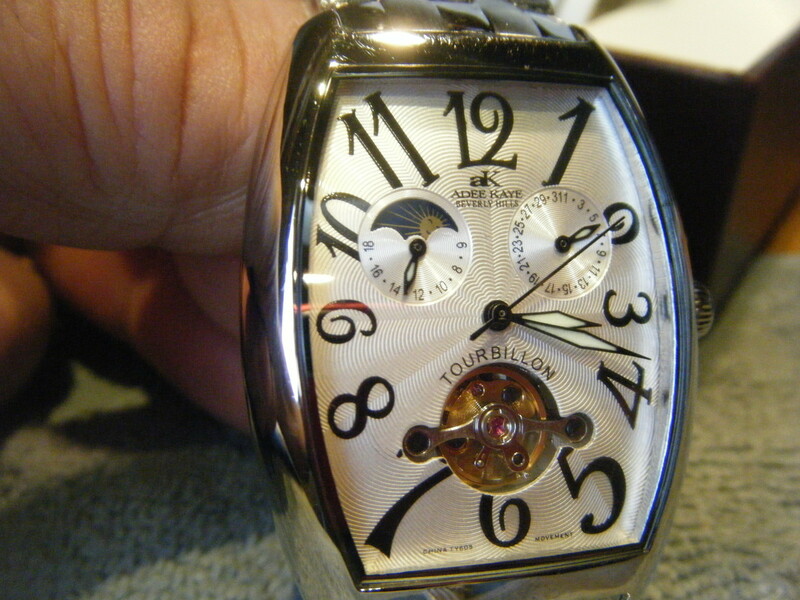 Railroads have had strict standards for timepieces since the mid-1800s. 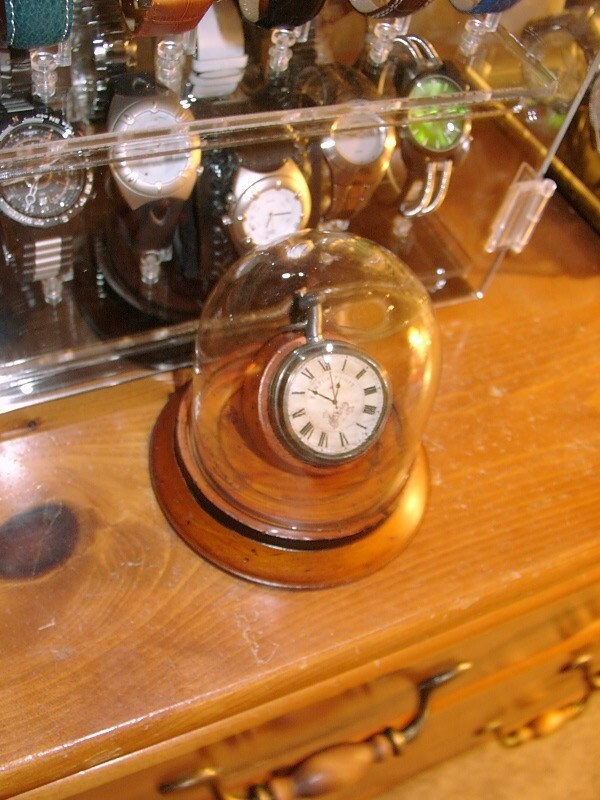 This replica brass station master’s watch reproduces one from 1908 and features “approved for railroad service” features such as an open-faced dial with the stem at 12 o’clock. 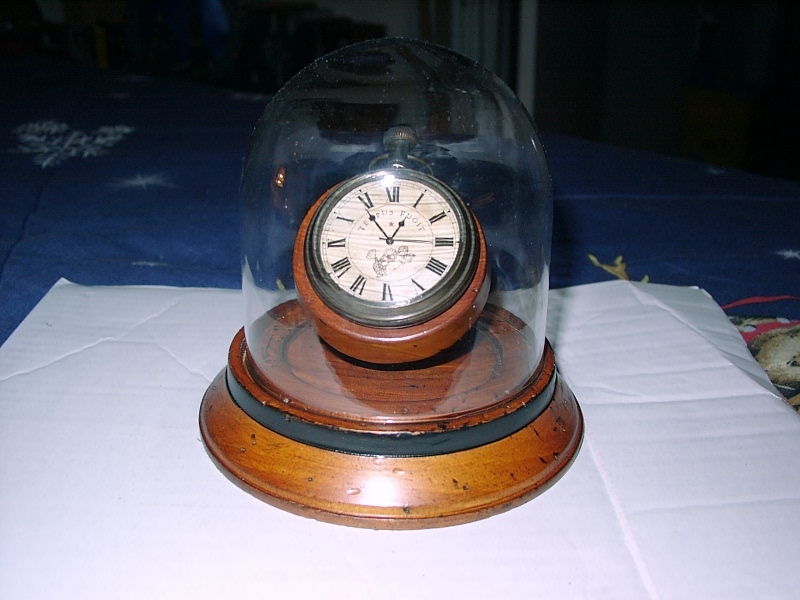 Made for display in this glass-domed case, as it would have been kept in a station master’s office. 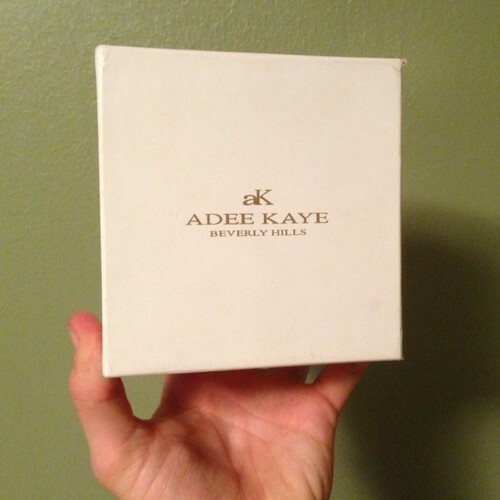 2012 Christmas Gift from my Sis! 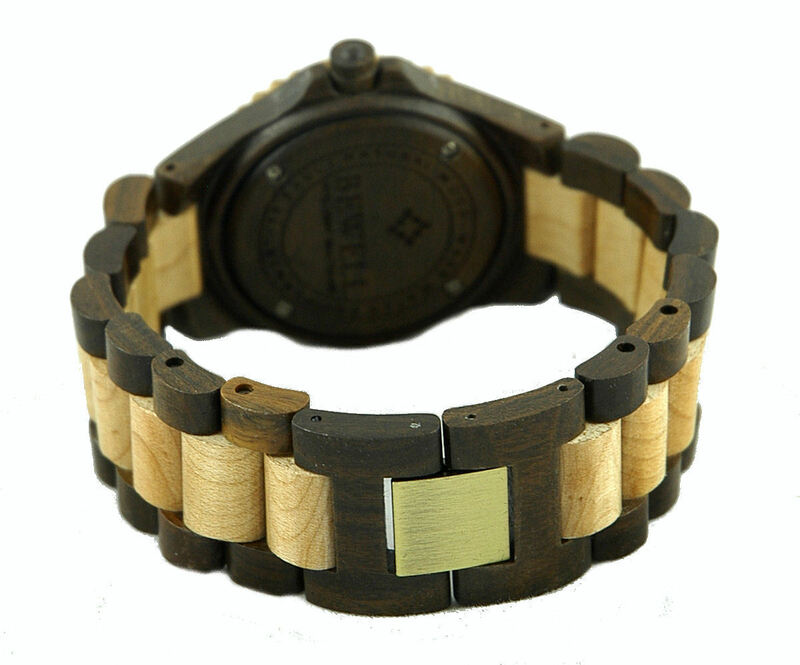 Number 2 of the Wood watches in my collection. 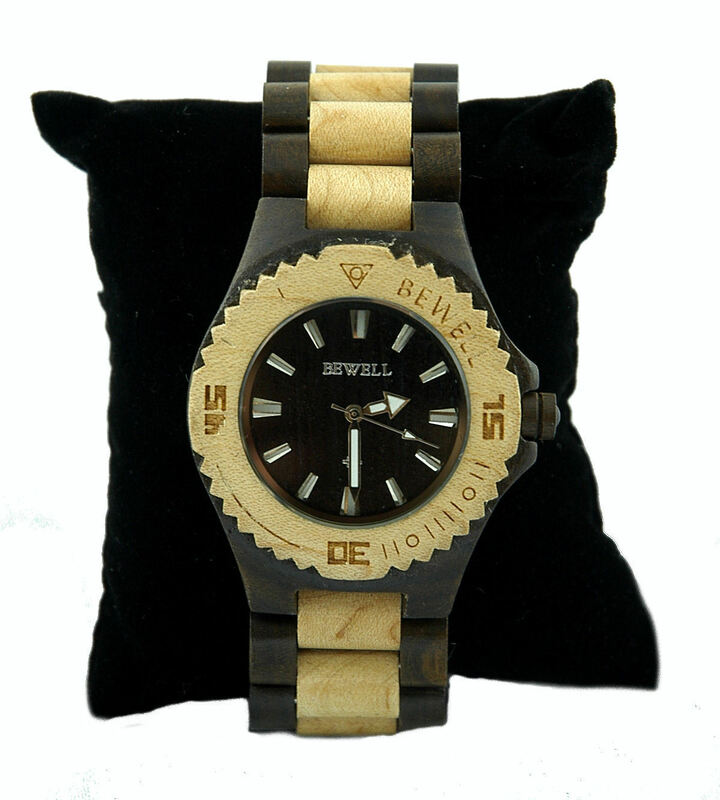 Wood watches are becoming very popular and are considered “Green” as they are hand carved from natural woods (this one is Bamboo and Sandalwood) and help keep our environment clean. 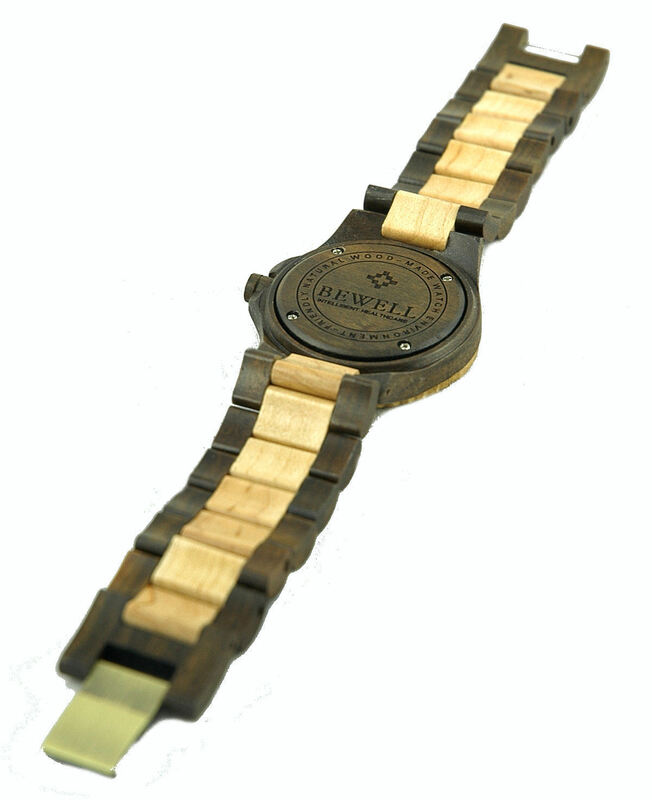 Wood watches are also said to become more beautiful with time due to absorbing the natural oils from your skin, which also helps to preserve them. 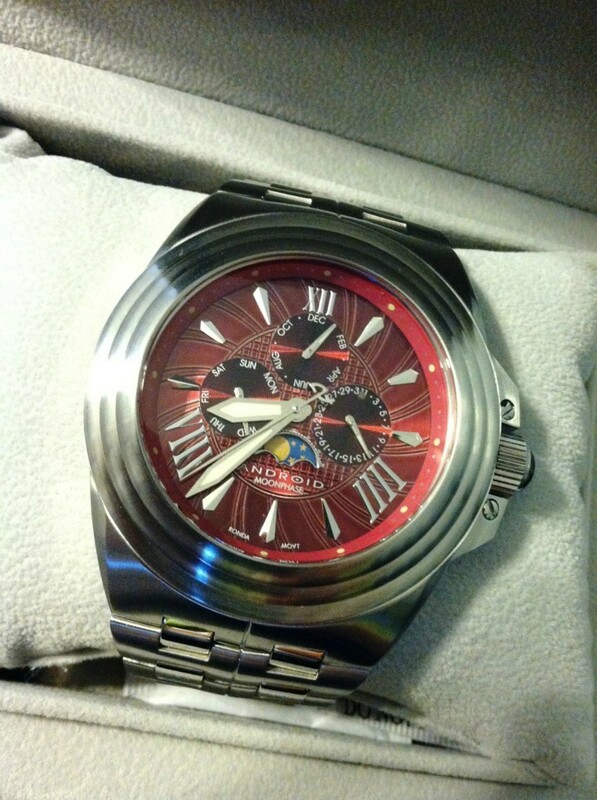 I fell in love with the design of this watch as soo n as I saw it for the first time about 9 months ago, my only complaint is the band. 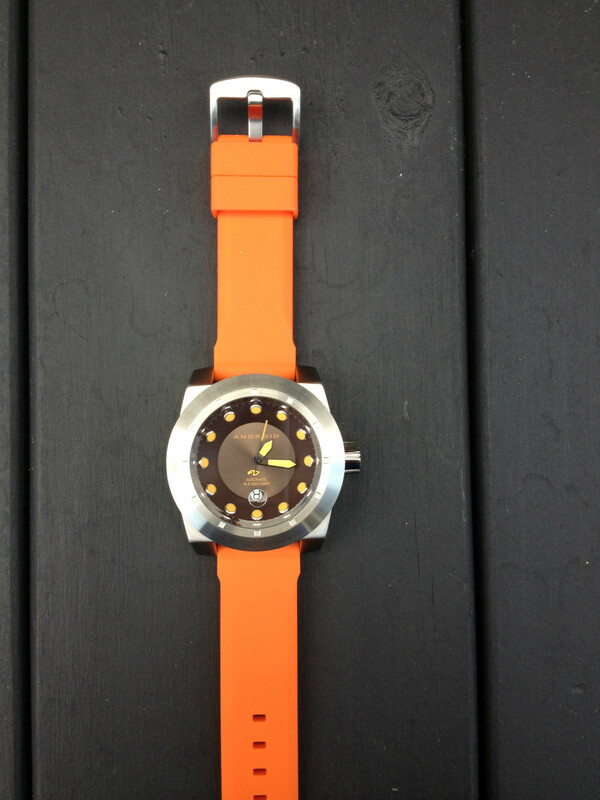 The hands and markers on this watch are a “Sun” yellow, which is a bright yellow that has a slight orange tint, yet they sell this model with a Fluorescent orange rubber watch band. 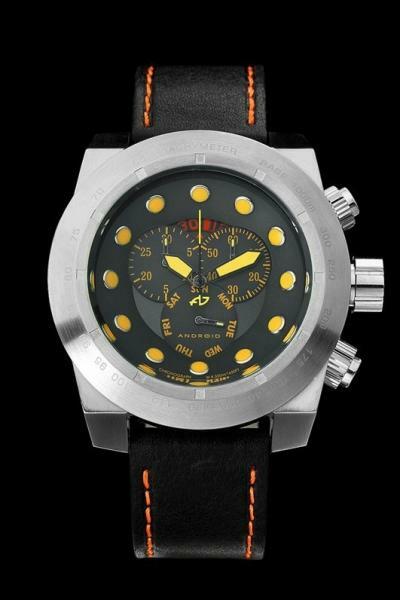 It’s a divers watch, so I understand the rubber part, but why Black Light Orange? The band should match the face or the hands and markers. 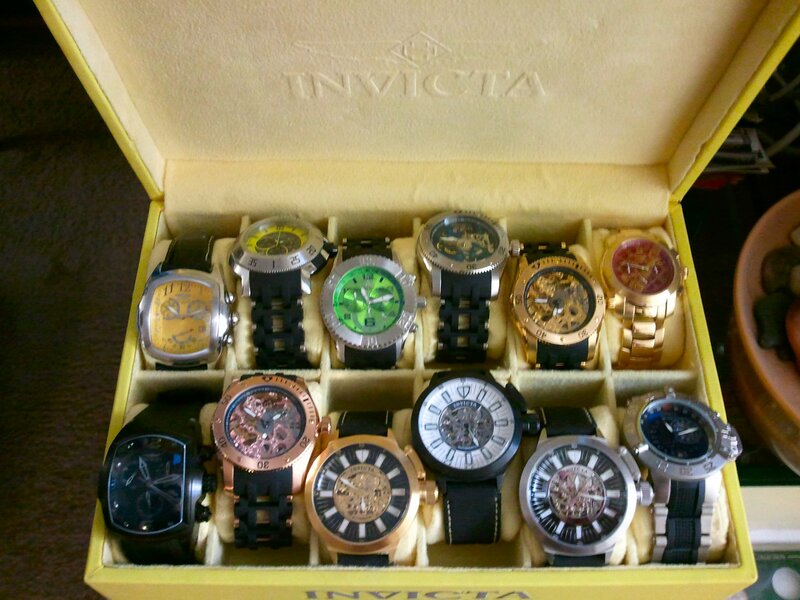 (IMHO) That being my general feeling on the matter, I immediately called up a dealer that I’ve gotten bands for my Invicta’s from, and had them ship me a black leather band with sun yellow stitches that should match the hands and markers and the face rather handsomly. 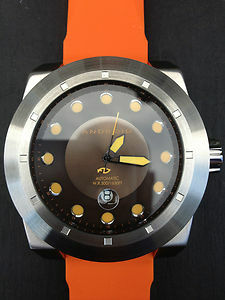 Interestingly, Androids next version up (shown in pics below), the Chrono version of this watch, comes with a Black leather band that has the same stitching but again, in orange. 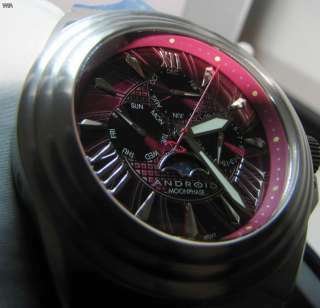 I also will be reserving funds for this slightly more expensive Chrono version. 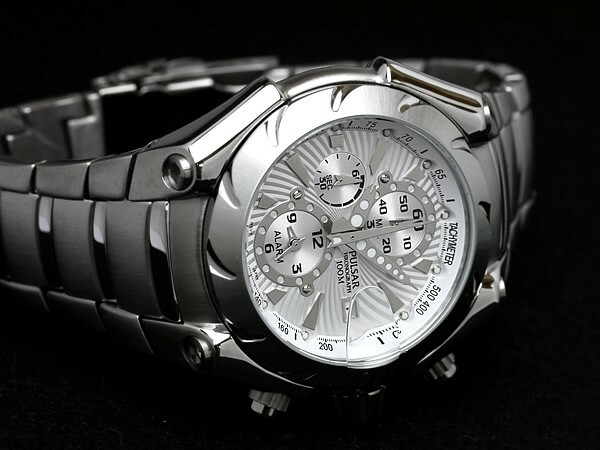 I’ve always liked Chrono’s, especially when they have an aviation look to them, and this one does. 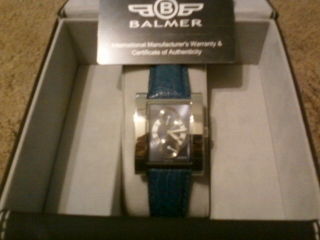 Number 2 of the Android watches in my collection. 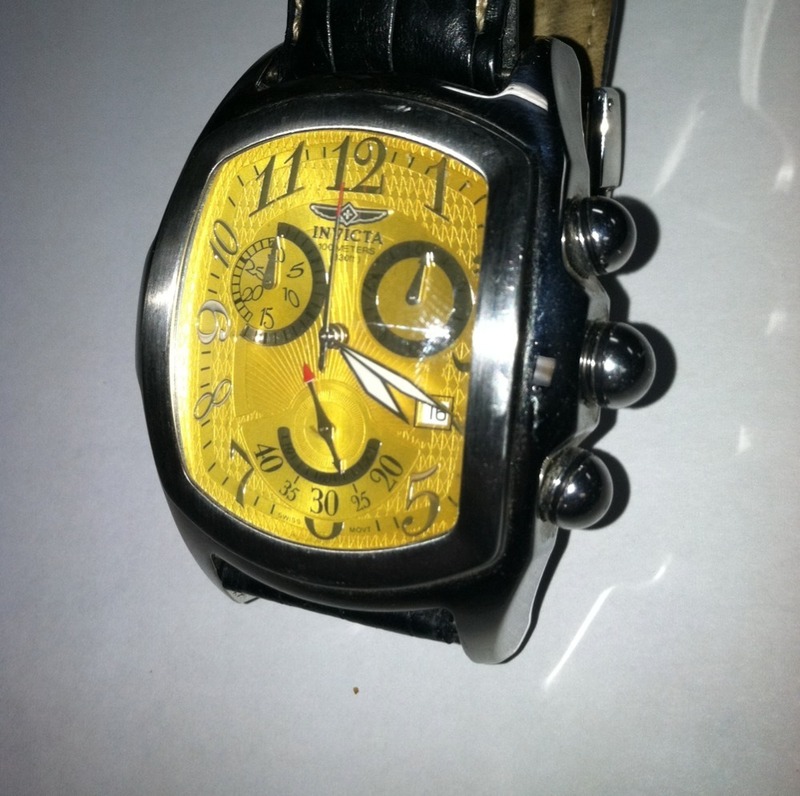 Details: I Originally received this watch as a gift when I was young. 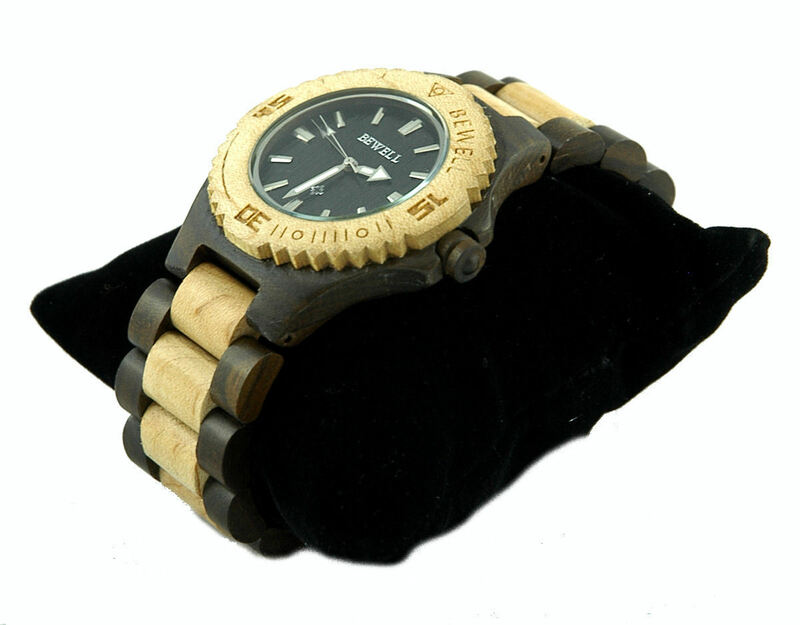 It quickly became a favorite, but didn’t get worn long before the band broke. It was put in a drawer then, until the internet came along and the bands could be easily found online. 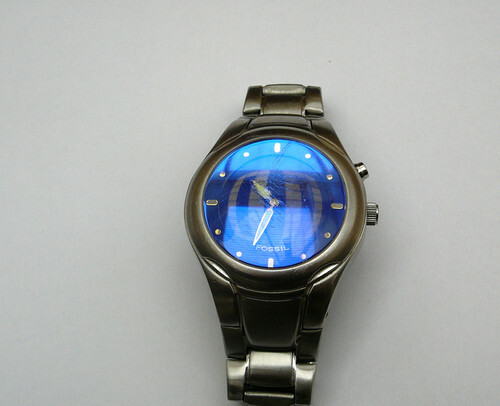 I always got comments on this watch. 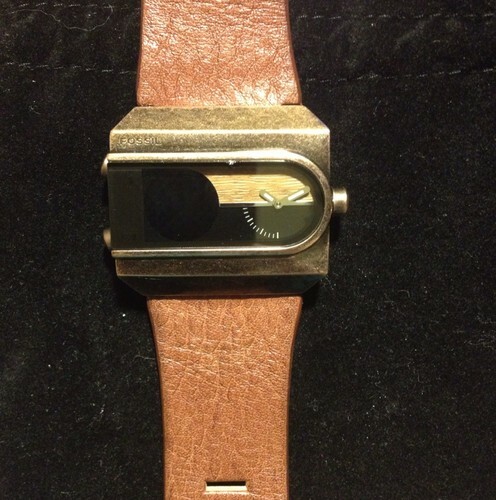 Eventually the bezel began cracking, so I improvised and engineered a way to use an exacto knife to cut away the cracked bezel parts (over the buttons on each side) and still have a fashionable looking watch. It bugged me though. 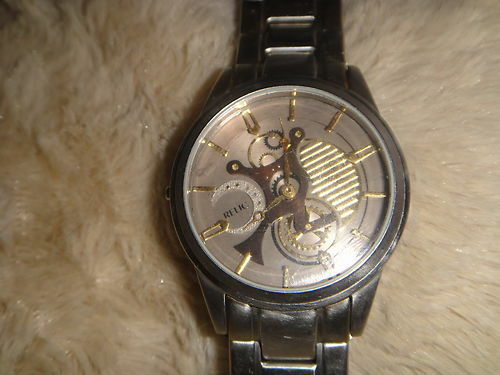 I saw one up for sale on ebay for $12 in perfect working condition, but the band was broke. I figured I’d steal it’s bezel to put on mine. When it arrived I discovered it was in better shape than mine was, so I ordered a band for it. 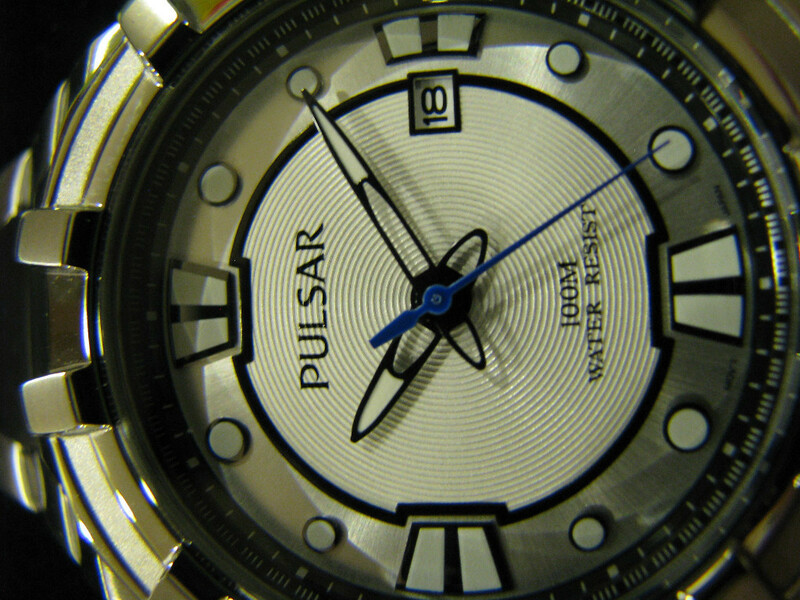 putting these bands on requires removing the Bezel. In removing the Bezel, it cracked in 2 places, and one of the top screw mounts broke completely off. 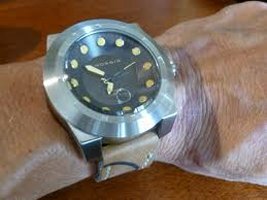 I repaired this with plastic epoxy and the watch now sits next to it’s altered bezel counterpart, looking almost brand new. 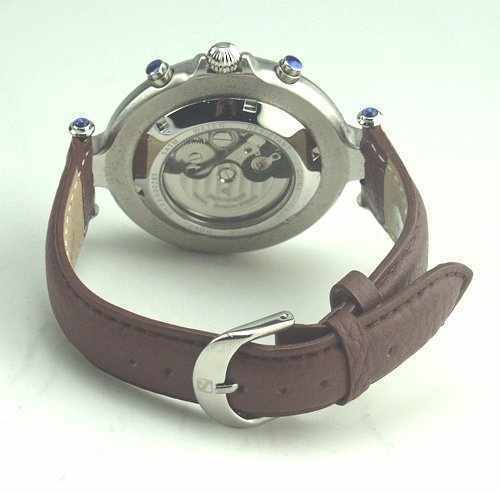 Throughout my youth I had 2 favorite watches, this one, and a Timex i-Control watch that was similar in size and shape, both had resin bands that broke numerous times and had to be replaced. 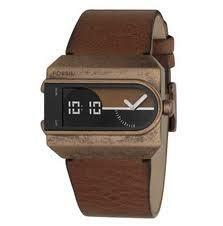 Unlike Timex however, Casio still makes the bands for this watch. Timex stopped making replacements for the i-control years ago. 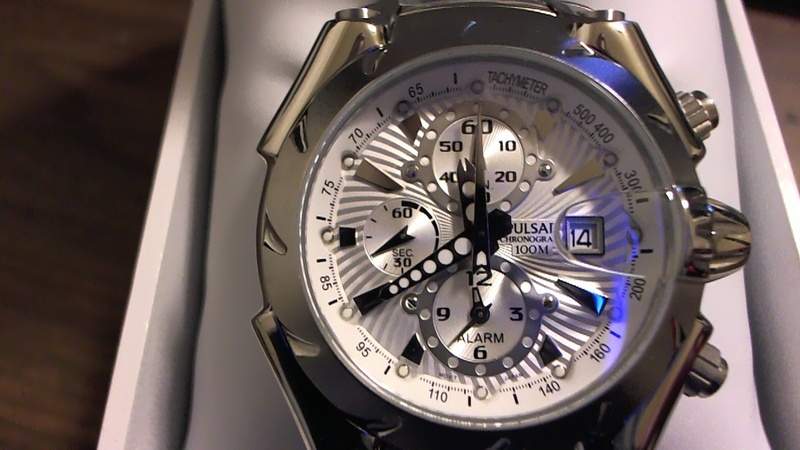 Generally speaking, I don’t care for watches with white faces, but this one definitely is a thing of beauty. One of my favorites, and one of the few I paid almost full price for. 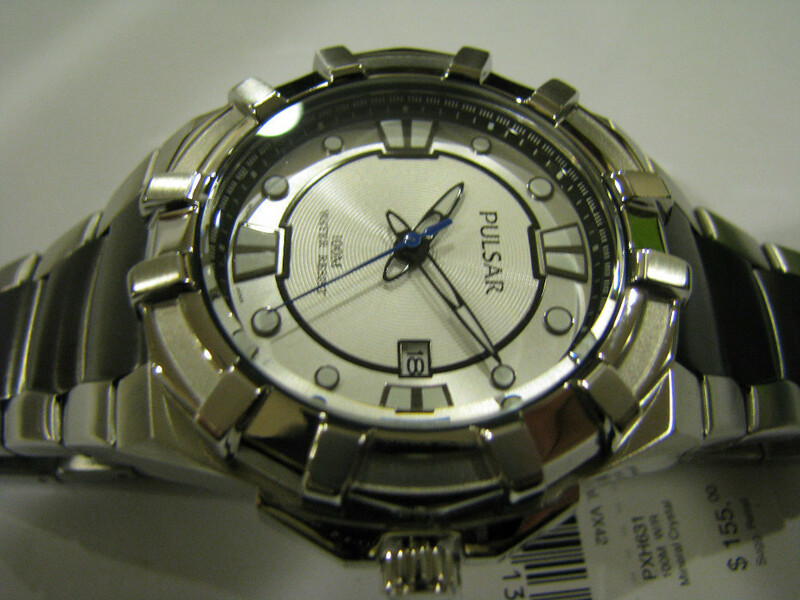 Details: Another Chunky Pulsar, actually, I had just purchased this one, and was looking for other Pulsar models I might like, when I came across the one listed above this one. 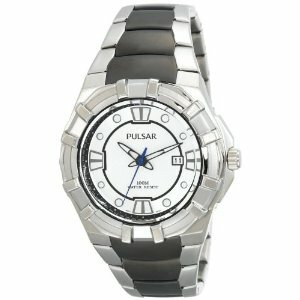 Currently this model is still sold in the U.S. and can be found for $70 on sites like Newegg, Sears, K-Mart etc. 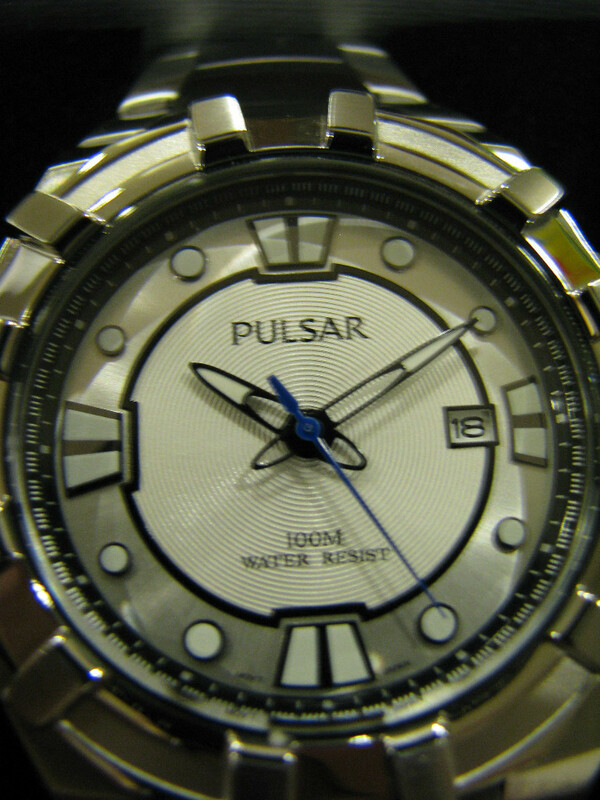 Another of my favorites, then again, each of my collection has some uniqueness and is a favorite, some more so than others, but ALL of my Pulsars bring a smile. I never did complete the task that started it all, attempting to find a Pulsar like a high school friend had that was big, and thick, but I did find a lot of other cool Pulsars instead. 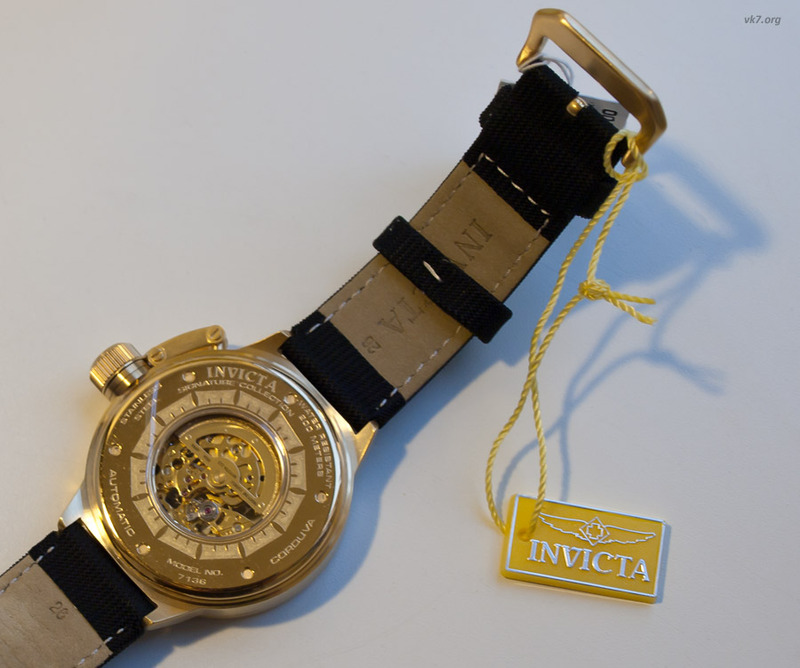 Details: I originally came across this model on ebay, which introduced me to Invicta watches. 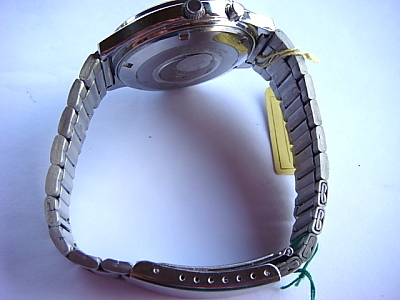 The 7136 being sold was used, was missing its band, and the divers screw down cap mechanism that covers the crown. I won the ebay auction, thinking I would order the missing crown cap. 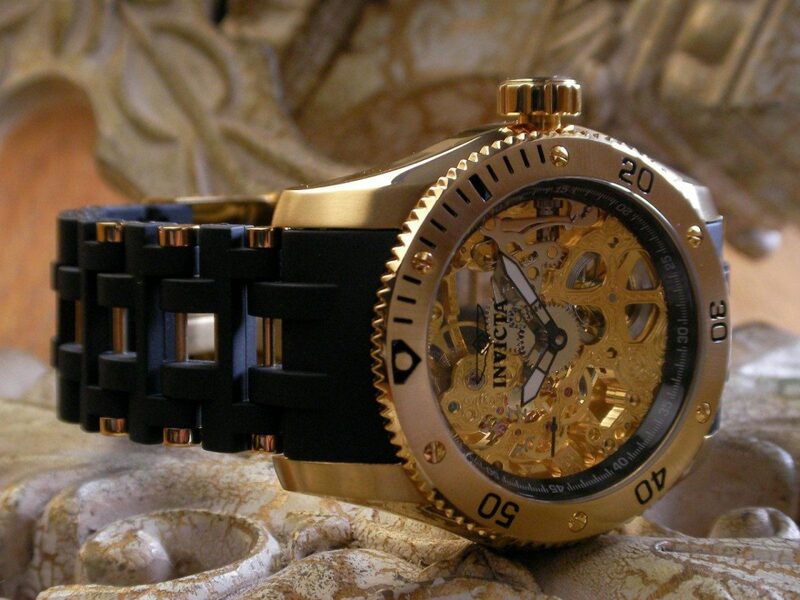 Invicta will not sell parts to customers, but requires customers to send watches in for repairs. 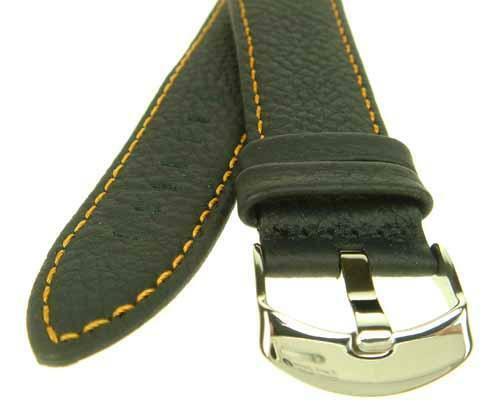 Still, I ordered a replacement watch band online, and wore my incomplete 7136 proudly. Even with the crown cover missing, it was just a beautiful piece of workmanship to observe. I spent months searching for a replacement crown cover and during that time learned how coveted and rare this model was. incredibly difficult to find at a low price or in new condition. 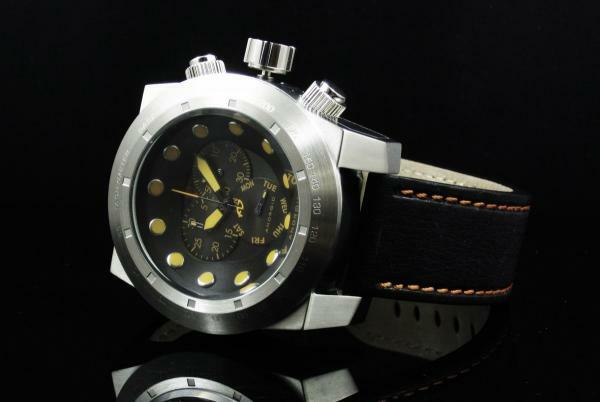 Then one day in my meanderings, I happened across an off the radar website listing one for $595 brand new. UGH! too much! I kept searching, and came across another site listing them for $250, but what I found was, most of these sites had never removed their pages when the 7136 was no longer in stock, so in reality, while still showing as available, a phone call revealed they were long out of stock. I had an idea though. I emailed the store listing the one for $595 and asked if they indeed did still have it, and they replied they did. I then sent them an email with a link to the ones listed for $250 and asked if they would match the price. To my surprise, they did, and sent me a paypal invoice. I didn’t hesitate to grab this deal, seeing as how this model in NEW condition is next to impossible to find. 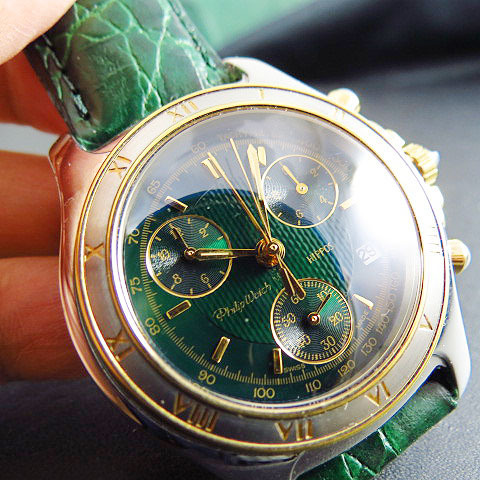 Details: Philip Watch is not a well known name for watches in the U.S., never the less, this watch making company has been making fine swiss watches since 1858. 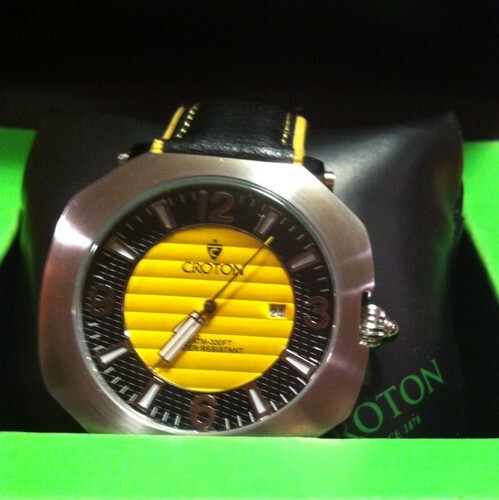 I couldn’t pass this one up even though I usually do not care for the color green on watches. 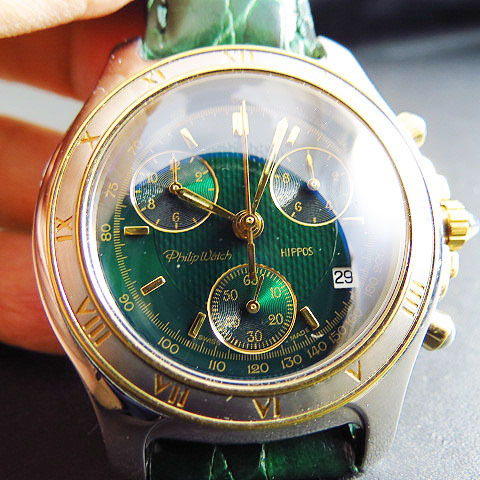 This is a beautiful green dial with matching Leather Band, and the Guillochage is very pleasing to the eye. 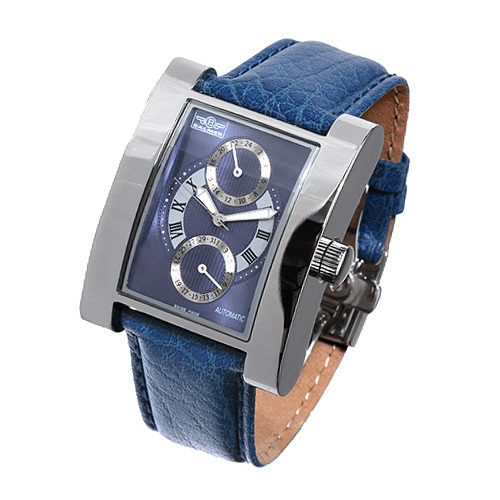 I once passed up a Blue Martell Chronograph with similar fine detailed Guillochage and to this day regret my decision, as that brand and model are simply nowhere to be found. Click on the LAST pic to see a larger view of the Guillochage. 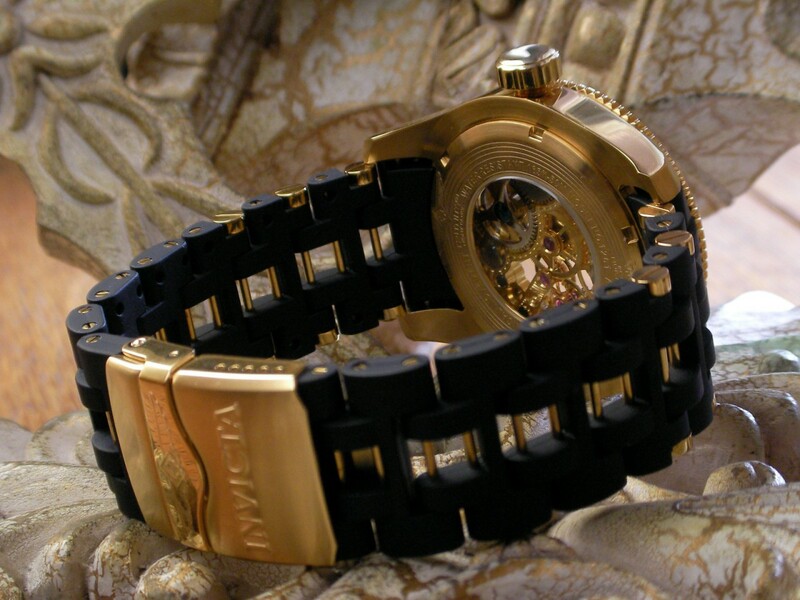 Guillochage – Ornamentation such as finely carved intersecting lines on Jewelry and watches, carved by a Guilloche. 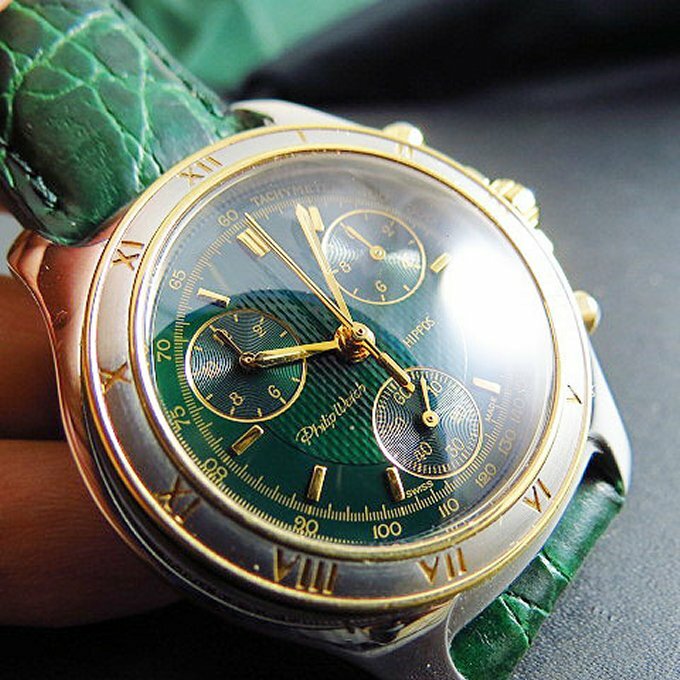 Guilloche – A rare artisan of which there are very few today that can perform the art of finely carving detailed hollow lines that intersect on fine jewelry and watch faces. Details: This was one of the first examples of NOS added to my collection. 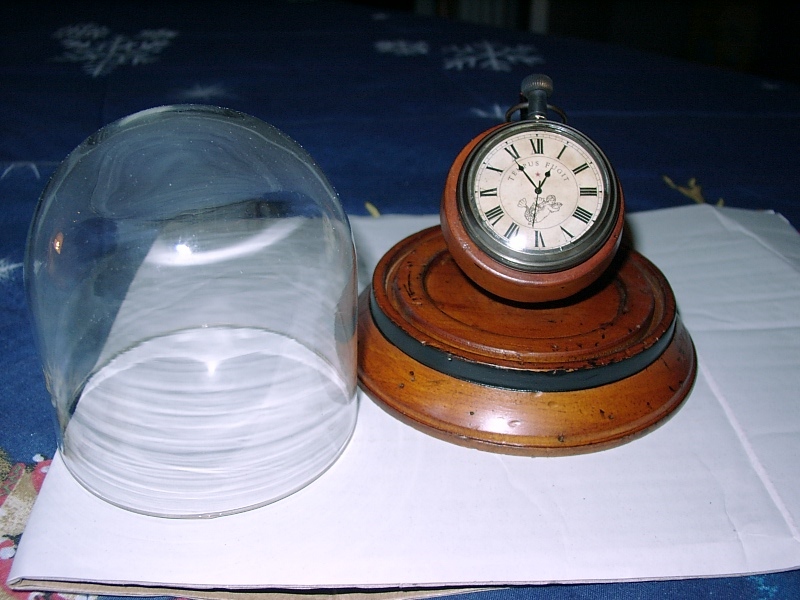 New Old Stock – Stock of Brand New Items that have been socked away unopened for many years. A 70’s model that reminds me of the Refit Enterprises Deflector Dish. 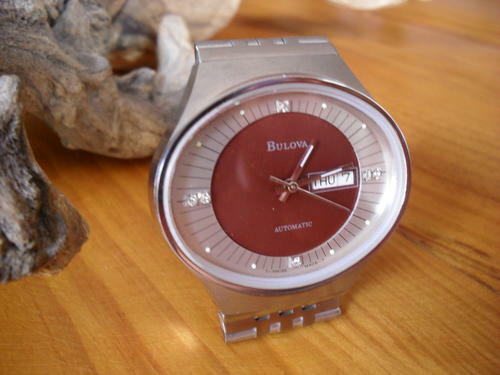 Another of my favorites, and it’s a Bulova, what more do you need to say? I have the black version of this also, listed below. 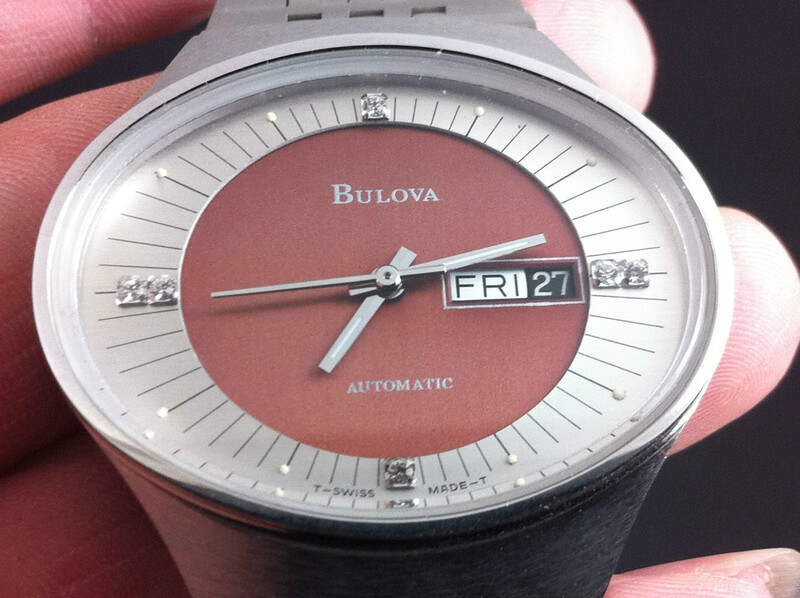 Details: Another elegant version of this watch. 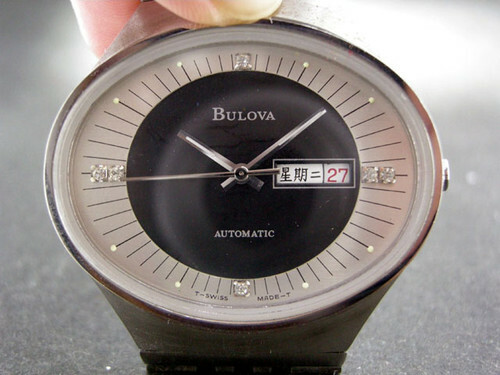 NO, I don’t read Chinese or Japanese, the date dial also reads in English but that is not shown here. 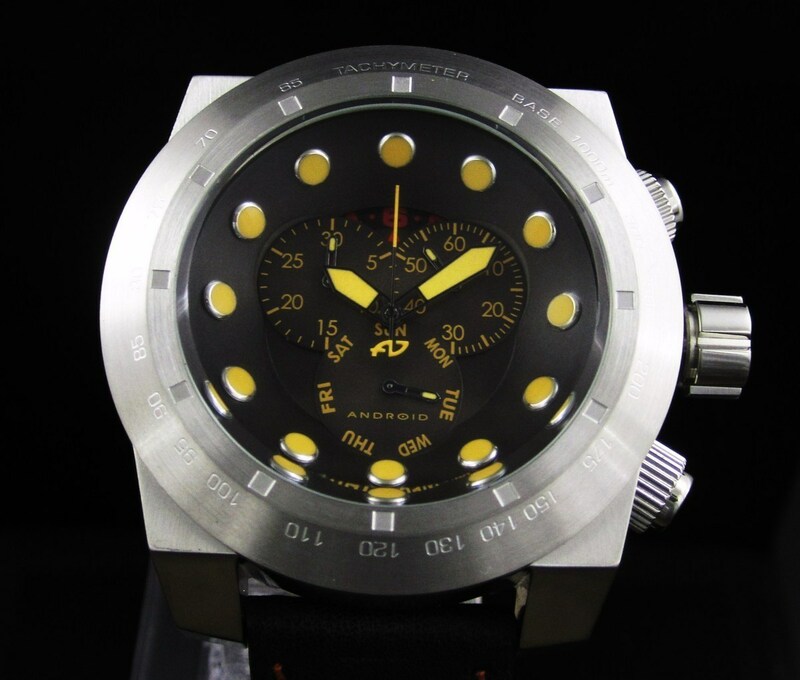 12) Android Divemaster Predator Chrono Moon Phase. Details: What can I say? 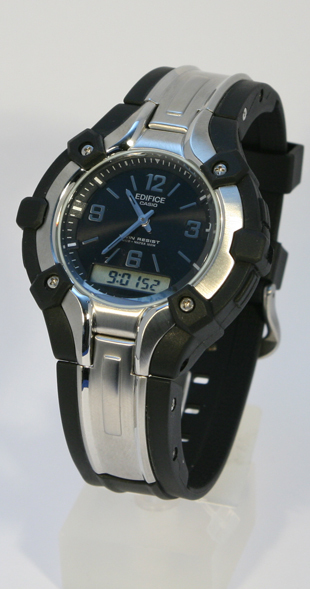 I love big chunky watches, especially Android’s. 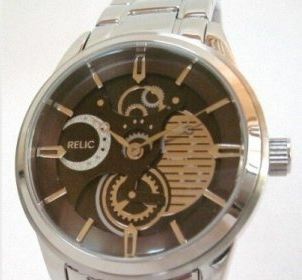 This one is a Chrono, and even has Moon phase. 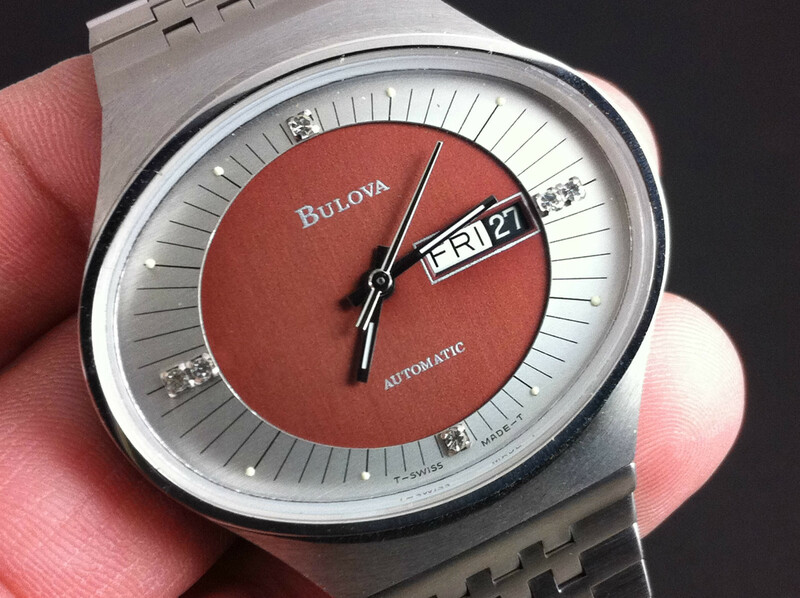 Another watch with an eye pleasing dial. 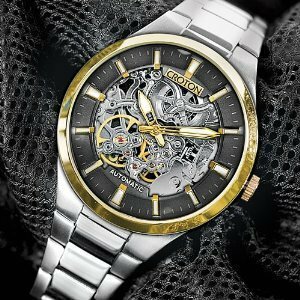 Details: I’ve always been attracted to Skeleton watches, especially when they’re nicely done with details like this one. Details: This was one of those, it’s Christmas Morning and no one is bidding on this, maybe I can get it for a steal, deals. 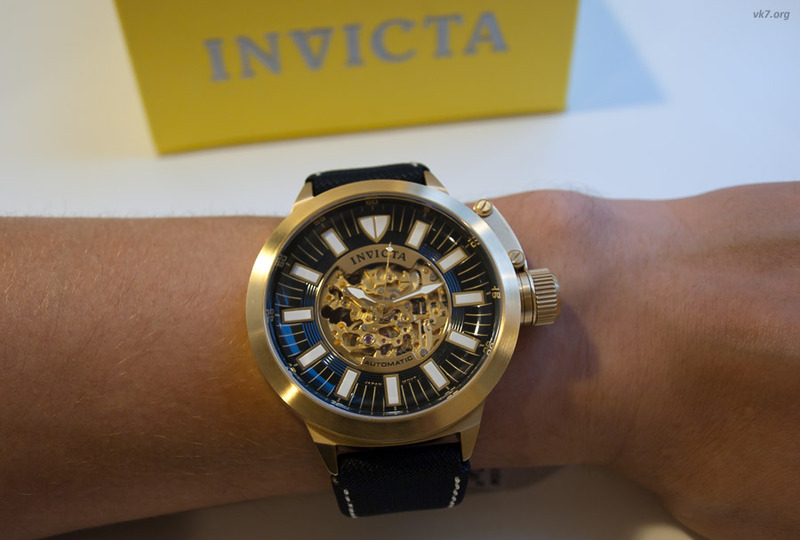 This is a very nice watch that’s stylish, but not overbearing. (it’s semi chunky) Definitely one of the Jewels in my collection. no matter the model, they always sell at a higher price, with lots of bidders. I’ve seen many Orient’s that were attractive, I would have liked to have, but those passed me by, due to how high the auction went. 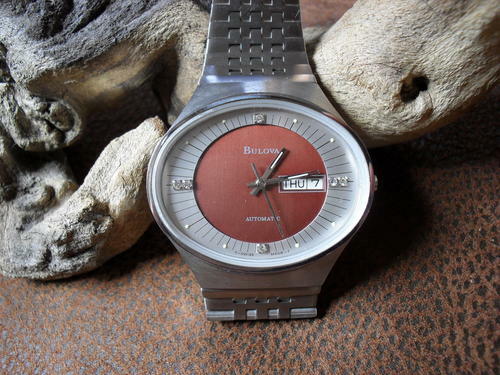 Finally, I came across this one, and even though it went a little higher than I wanted, I went through with it, and can now say, I have an Orient in my collection. 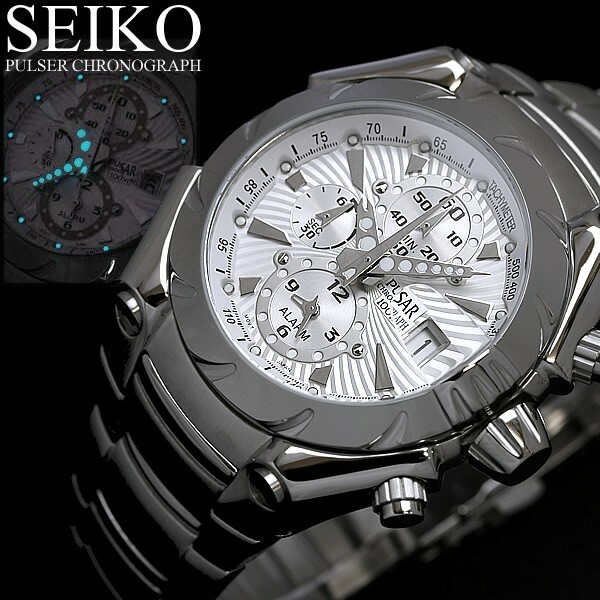 The design of this watch reminds me of a Seiko I have that also has the silver with small gold highlights. I’m always attracted to silver with finally detailed highlights that are gold. Details: Many Croton’s don’t stand out as unique to me, however I have 3 that aren’t like the rest and 2 of them happen to be black and yellow. 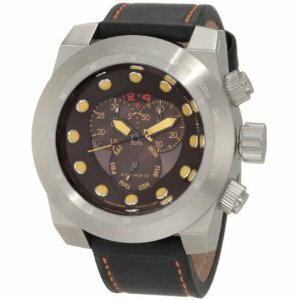 Details: Like Croton’s, I feel that most Timex’s are just average, everyday looking watches, but there are a few unique models, and I have some of those. This is one of them. 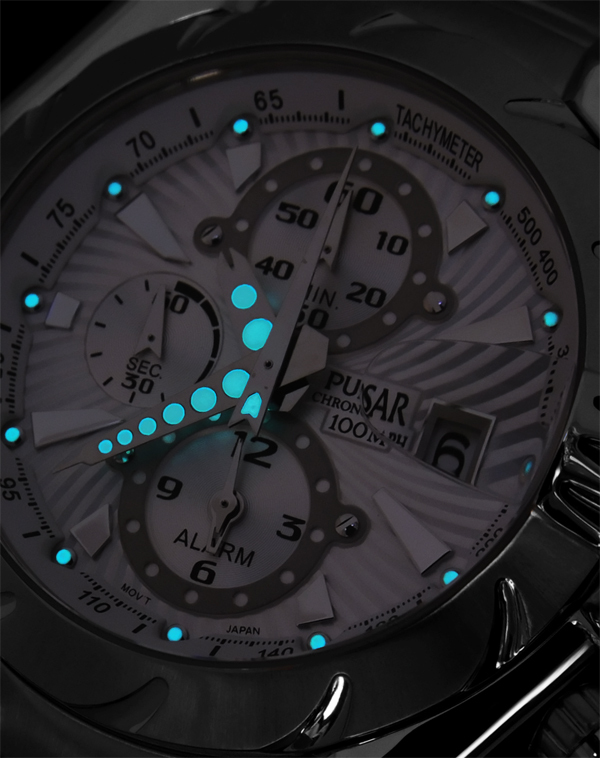 Tide, Temp, Compass, Day, Date, indiglo, and good looking too. It’s hard to see but the band is actually 2 tone, silver and black. 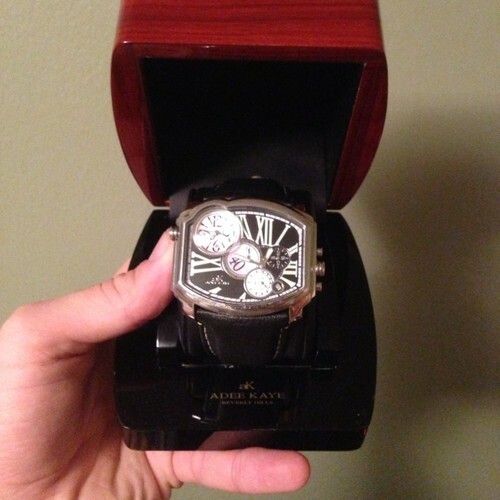 Details: I thought I’d stumbled into another killer deal via auction, until I opened the package upon arrival to only discover the watch didn’t work. 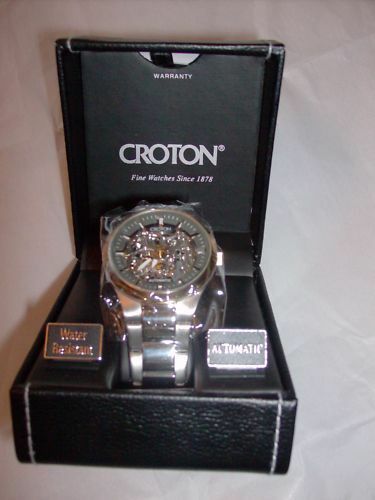 Checking the auction again, I discovered I missed the small print at the bottom that said the watch didn’t work and probably needed a new movement. 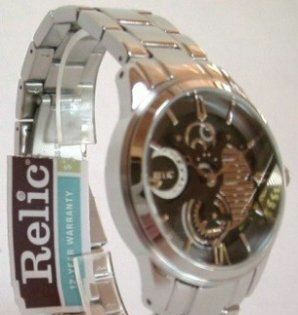 I have a contact at a watch repair shop in downtown L.A., I called him and was able to obtain a replacement movement for $14.95. 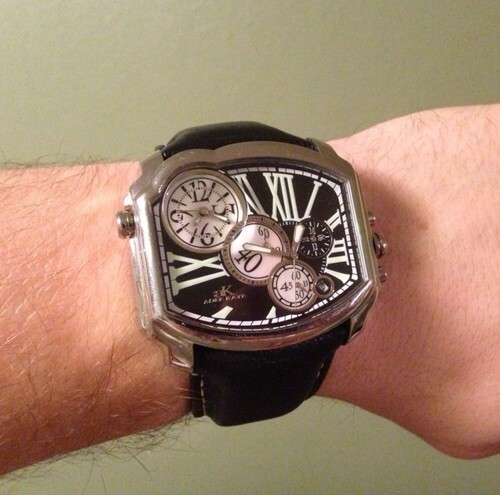 So as it ends up, after swapping out the movement, I did end up getting another killer deal! Details: Lupah’s are a good example of Guillochage, and there domed crystal tend to act as a magnifier, highlighting the Guillochage. Of all the models out there, the yellow faced ones really show the detail and patterns. Click on the pic to the left to open a larger version in a new window that really shows the detail. Lupah’s are a lot larger than you’d imagine. See the pic at bottom of both the Men’s and Women’s model for an example. Details: I Have 2 of these, both shown here. I’m not sure if they’re different model numbers, but they are different colors. 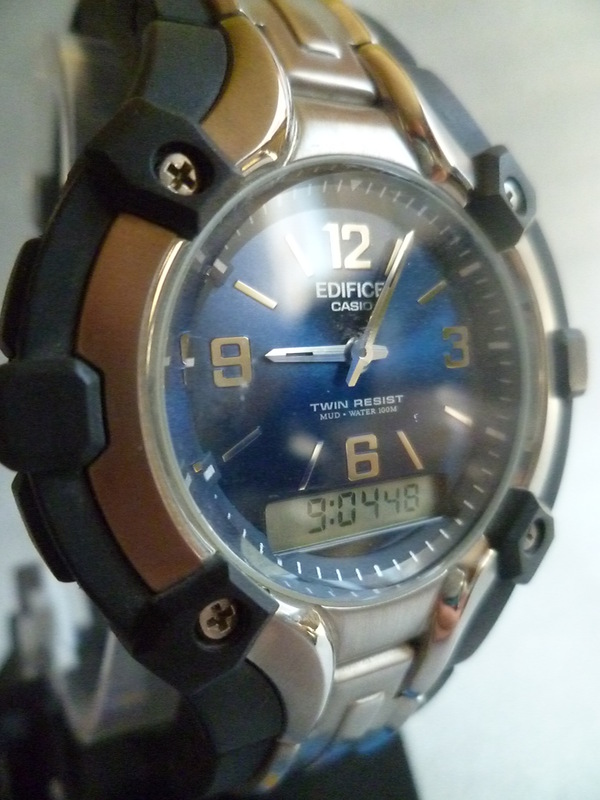 The first, a bronze color with a Blue laser crystal, and gold animated numbers counting the seconds. 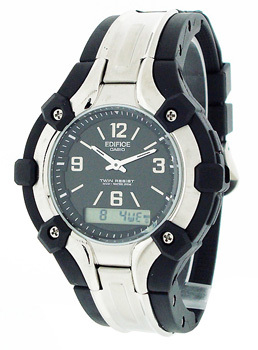 Details: Number 2 of this style of Big Tic is actually silver, with a normal clear crystal and silver animated numbers counting the seconds. 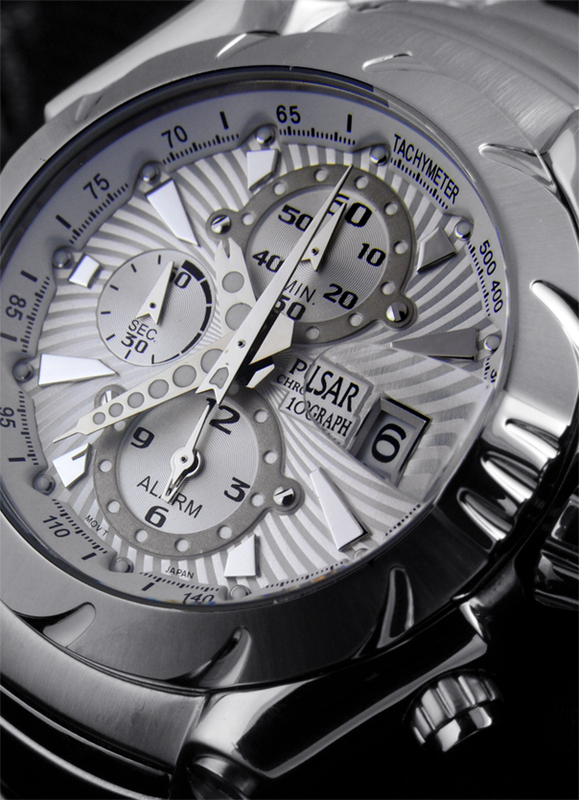 The Chrono’s on this watch are Hour, Day, Month and Year, unlike most chrono’s which don’t include the year. 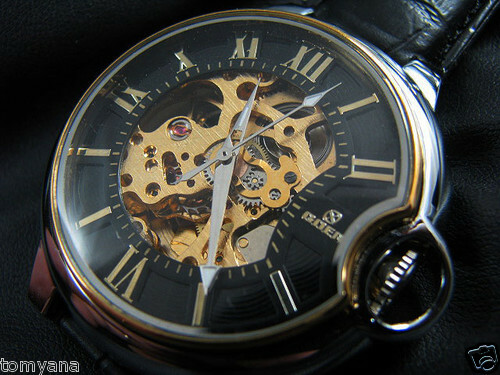 Totally a SteamPunk watch, this one is up there on the favorites list. 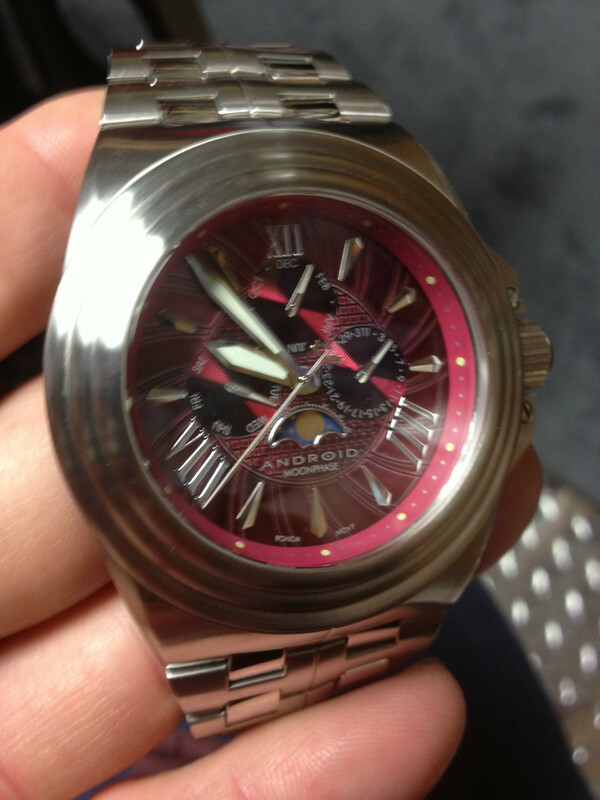 Notice the lugs where the band attaches. 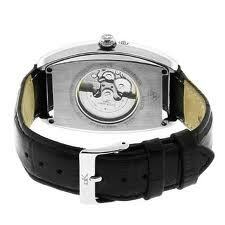 This lug style is a throw back to the 1920’s when wristwatches had these types of lugs. 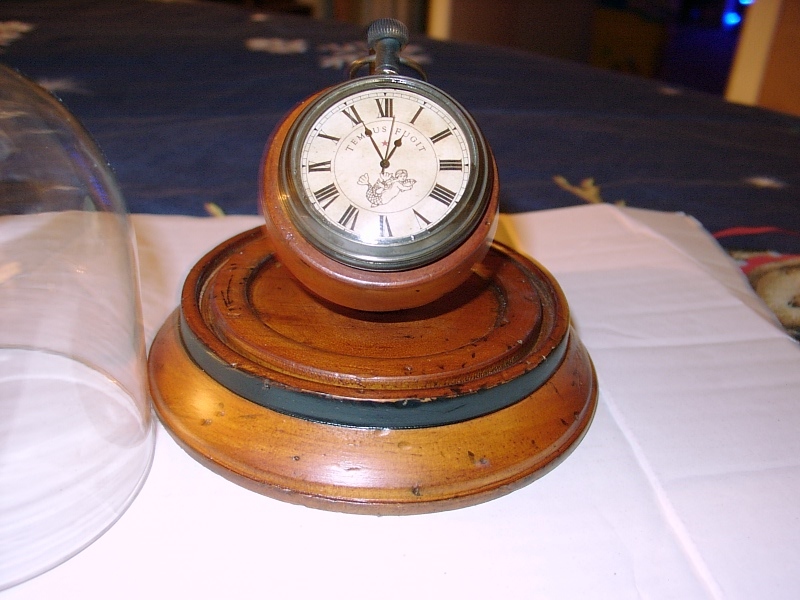 Many were pocket watches that had lugs added to convert the watch into a wristwatch. 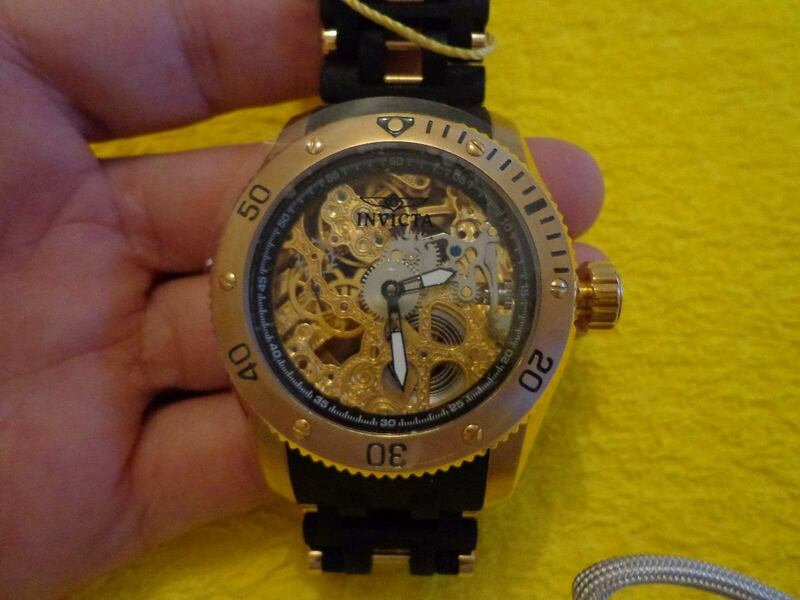 Details: This 90’s unisex model is an excellent example of a see through automatic skeleton. 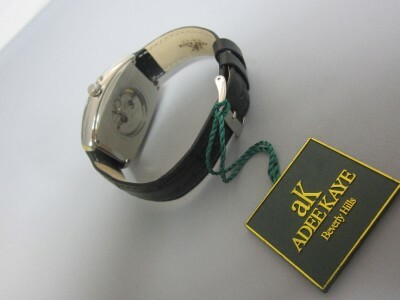 I’ve said before that I don’t really care for white faced watches, but here again is an exception. 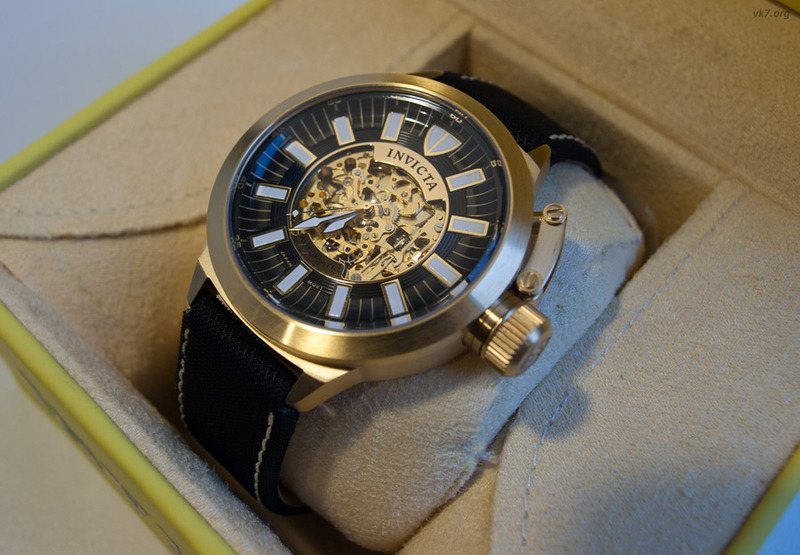 The Black, Brown, and Champagne versions of this watch in my opinion are just not as good looking as the white, which really highlights this models Guillochage. 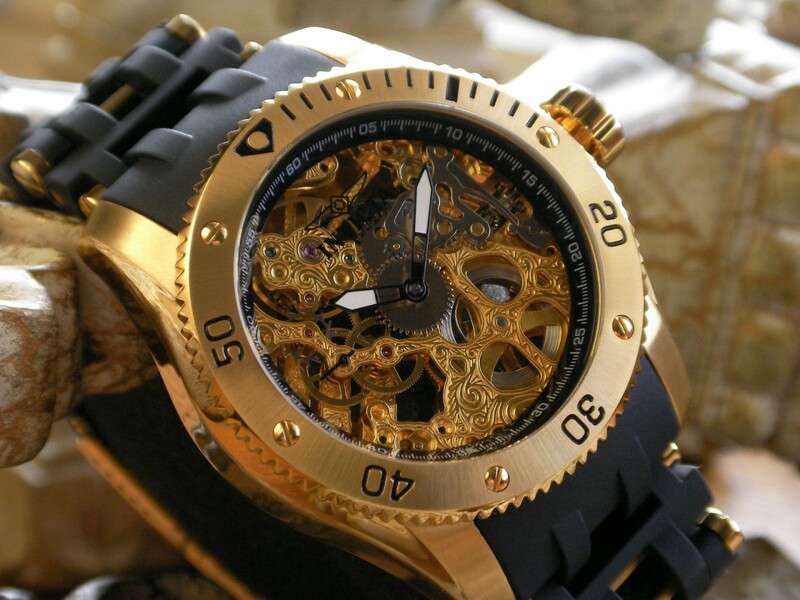 Details: An interesting design that falls into the “Steampunk” category. This one needed a new battery installed, but works great. 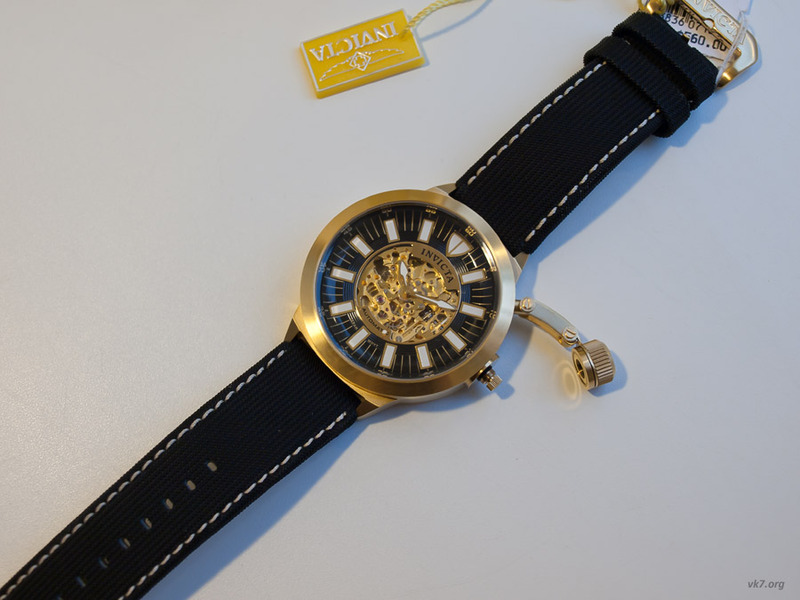 Details: Orkina is one of those “Overseas” inexpensive brands that are surprisingly good quality and also good looking. 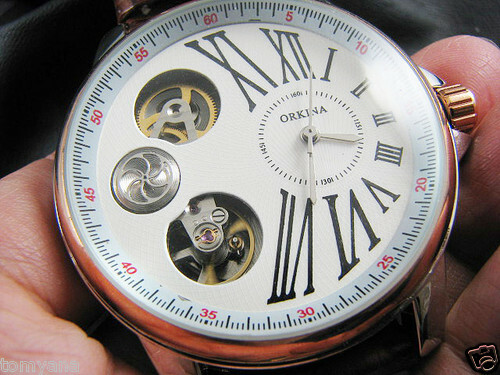 Orkina also makes many HUGE watches, this is one of them. If you go searching for this model you’ll have trouble finding it now though. 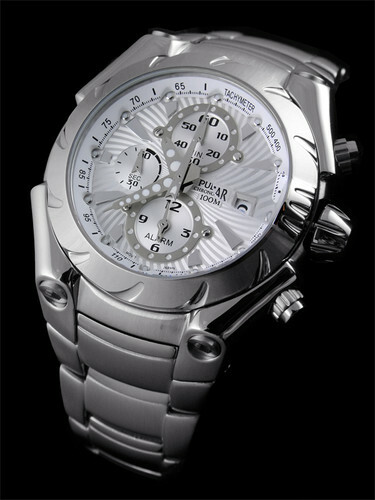 Details: Goer is another one of those “Overseas” watch makers that are also surprisingly decent looking and good quality. I Have a couple of Goer’s, Skeletons and Tourbillions and the same with the Orkina’s as shown above and all of them look “Dressier” in person than you would believe from the pictures. Details: As soon as I saw this on ebay, I had to have it. 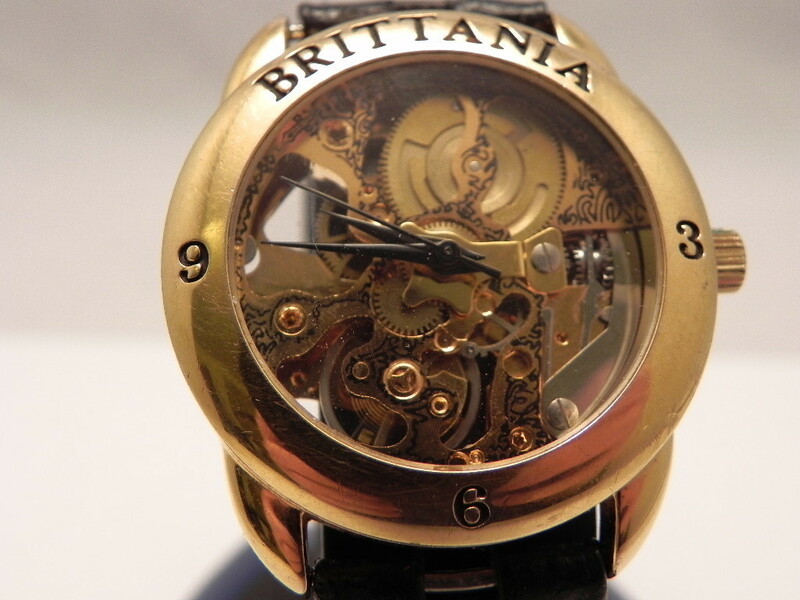 it’s so steampunk, yet elegant in it’s own way. 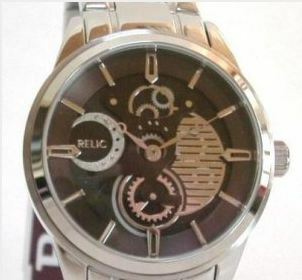 Unfortunately I failed to notice that the sellers pic at left showed the watch’s true condition. There’s no stem or crown. On top of that, upon testing I discovered the movement didn’t work at all. I contacted the seller who indicated she had assumed it was working and didn’t even notice the missing stem and crown. She emailed me saying she was refunding the full amount and shipping. I emailed her back letting her know not to do that, but give me a discount since I could get replacement parts, but she would have none of that and gave me a full refund. I was able to get a replacement Crown, Stem and Movement for a total of $16. 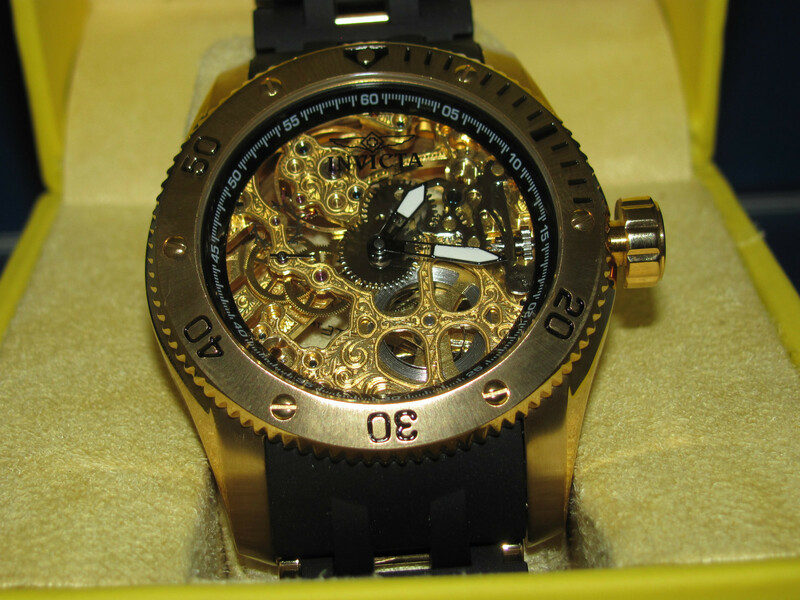 There is no second hand on this watch, however like A chrono, this has a separate seconds counting part of the movement, in this case instead of the face having the printed chrono circle and a hand, this watch has a gear that moves and counts the seconds. (The bottom gear) which proved to be difficult to get in place as it goes on an incredibly tiny arbor (spindle) above one layer of the face, but below another. 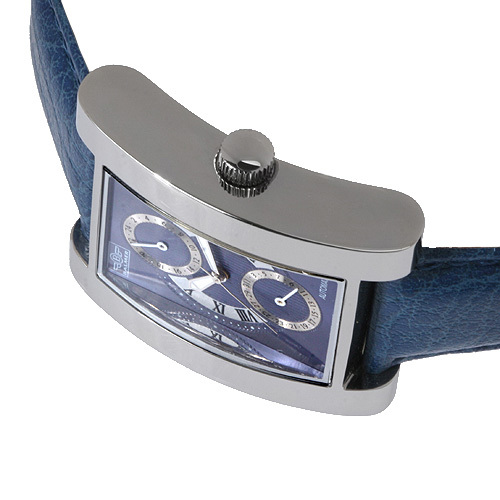 This watch face is actually 3 or 4 separate pieces that have to be mounted in a certain (layer) order.